Chalk it up to cabin fever, a burgeoning economy, or the dulcet drone of Mercedes pitchman Jon Hamm. Sales of German luxury cars have never been better. In the first three months of the year, Audi, BMW and Mercedes sold 1.3 million vehicles worldwide, 9% more than in the year-earlier period. The Teutonic bragging rights stayed with BMW. It sold almost 451,600 vehicles around the world in the first quarter, besting 438,200 at Audi and 429,600 for Daimler’s Mercedes-Benz brand. Records were broken all around. The whole exercise is a bit silly. Talking about volume without strapping it to profit is like spouting the specs of an engine without mentioning the size of the vehicle in which it sits. But this is the auto industry. Underneath every Hugo Boss suit in the C-suites of Munich and Stuttgart is a person who simply loves to go fast. Steering is critical, but speed is king. Despite a rising tide of buyers, BMW, Mercedes and Audi seldom talk about raising prices, and chatter about keeping costs in line is usually tacked onto the end of corporate communications. Usually, the companies simply crow about performance metrics and volume gains. And each of the Germany-based luxury players appears dead set on being the luxury leader, in terms of units. Massive sales gains, however, present tricky terrain for a luxury brand. In addition to the pitch-perfect engine, baby-soft seat and a fancy hood badge, the appeal of a German-born luxury car, at least in part, is prestige: the air of exclusivity. To get numbers up, Audi, BMW and Mercedes have steered towards slightly less tony parts of town. Each automaker now has an entry-level model priced around US$30,000 (RM111,600) in the United States. When one opts for a lease instead of purchase, as slightly more than half of entry-level luxury buyers do in the US, the customer joins the swanky set for only a few thousand dollars. How do Germany’s car bosses deal with that potential stigma? Lately, they’ve just made more varieties of car. In the past 10 years, the number of luxury model lines in the US has surged 26%, to 90 in total, according to TrueCar, an online car-shopping platform. That number doesn’t account for such further variations as different body styles or hybrid engines. 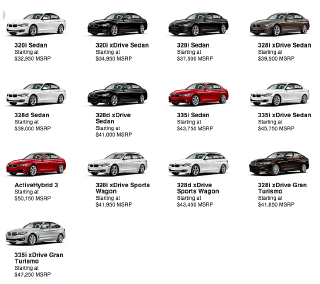 Sure, lots of people buy BMW’s 3-series, but how many have the bigger engine with the all-wheel-drive system? Or the wagon version? Or the Gran Turismo model? Indeed, BMW’s best-selling vehicle — the standard by which all luxury cars are measured — comes in 13 variations. These cars are ubiquitous, but BMW has made sure that each buyer feels at least a little bit special. By 2020, Mercedes will launch 30 models, including 11 all-new vehicles. Audi, meanwhile, says it will expand its line-up from 52 models to 60 by 2020. German executives are playing a dangerous game, though. There’s a burgeoning — and by now, pretty robust — field of research showing that an expanding product range can have a chilling effect on business. Adding options often wears down both consumers’ willingness to buy and even their well-being. In short, shoppers boggled by the SUV aisle at the Mercedes store may just Uber over to Cadillac, where they will find utilities in just two sizes: regular and Escalade. Cadillac is counting on just that. The brand’s marketing chief Uwe Ellinghaus says its biggest opportunity is “the ubiquity of the Germans”. Last year, drivers bought almost seven BMWs for every Cadillac.